Part of the family that the Raccoon belongs to, the Ringtail, also called a Cacomistle in some areas, is quite often called a Ringtail cat. It is not however a cat at all, but rather another family entirely and probably more closely related to the dog family than it is the cats, although it does catch mice and small rodents, and for that reason was sometimes trapped by miners and kept as a pet. It was placed into a box in the daytime hours and let out at night to hunt for the mice in the miners cabins, which earned it the name, Miners Cat. The Ringtail is medium to dark brown colored with a white underbelly and a very noticeable black and white striped tail that is longer even than its body. The eyes are quite incredibly lovely, and also very noticeable, being large and purple in color, with both of them surrounded by a white or tan circle that emphasizes them even more. The Ringtail is somewhat smaller than a housecat, and may grow to be about foot long in body with the tail adding another body length or more. They are found in California, Colorado, Arizona, New Mexico, Nevada, Texas and even south to the northern parts of Mexico. It lives primarily in dry forests where it will make its nest in tree hollows or downed logs, or in other wooden areas. One interesting part of the ringtail is that it is flexible and can rotate more than 180 degrees, which helps to make the ringtail an incredible climber. 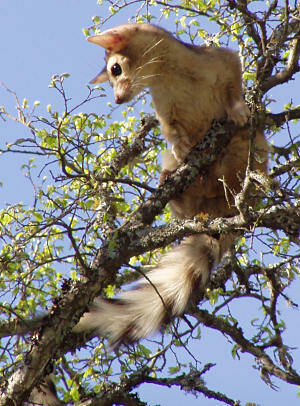 Ringtails also climb by pressing all four feet on one wall and their backs on another, a process which is called stemming. Ringtails are nocturnal, quite shy and very rarely seen. They will eat fruits, berries, insects, lizards, small rodents, and birds. Animals which will prey on the ringtail are owls, coyotes, raccoons and foxes. As adult ringtails the only time they will gather in a pair is when they are mating. They mate in the springtime, and after about 50 days the young are born. The male ringtail gets the food for mother while she is in the den. The young ringtails are called cubs, and there are usually 2-4 of them born at one time. They are born blind, but will open their eyes after about a month. At four months they are hunting and at about ten months they are independent and can breed on their own. The Ringtail will live for about 5-7 years in the wild. I saw same thing maybe a kit fox? I live in rural NW CT. Very similar behavior, I saw very early morning. live in fla saw squirrel like thing very dark body with ring tail ..what is it? awww this picture looks so cute where doese this animal live? I live in Southern Nevada and found an old mine full of these guys. I like exploring old mines and these guys were quite a surprise. Awesome little mammals and appeared to be very intelligent. I live in Port Charlotte Florida, my wife swares she has seen one at night ( more then one night ) is it possible?